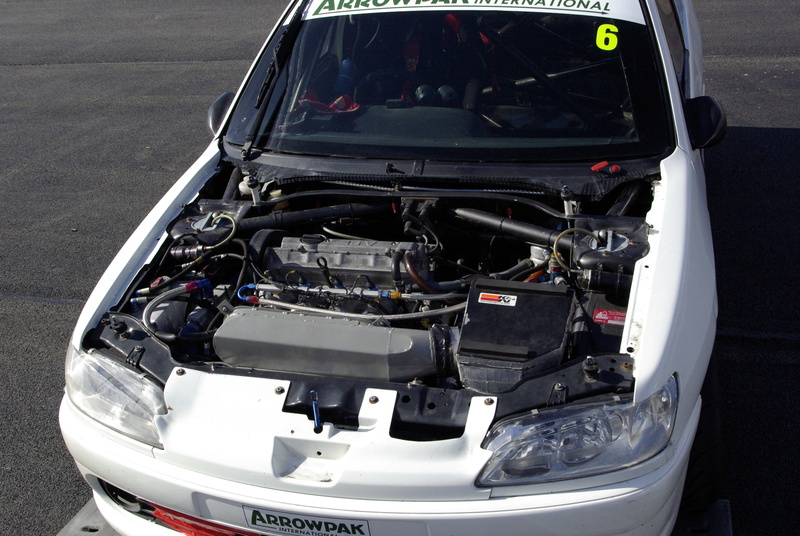 It’s strange that the first question people ask when they’re checking out modified cars is often ‘How much power has it got?’ It’s all well and good being able to say it’s got 400 bhp, but how much weight is that power having to shift? 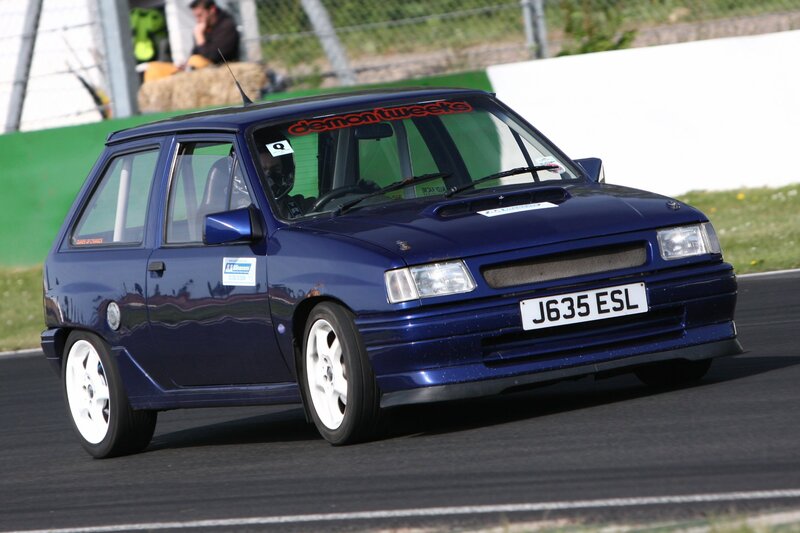 If the car weighs two tonnes then you’ve only got 200 bhp per tonne, which is suddenly less impressive. That’s only equal to a 100 bhp engine in a 500 kg car. The thing is if you tell people you’ve only got 100 bhp they’ll snigger and walk away. ‘Pfff, my Mom’s Corsa has got more power than that’. The conversation’s over before anyone mentions weight. Weight goes far beyond the simple bhp/tonne figure though. Bigger engines will often produce more than enough power to compensate for their extra weight. Carrying a hoofing great engine around does nothing for the handling though. 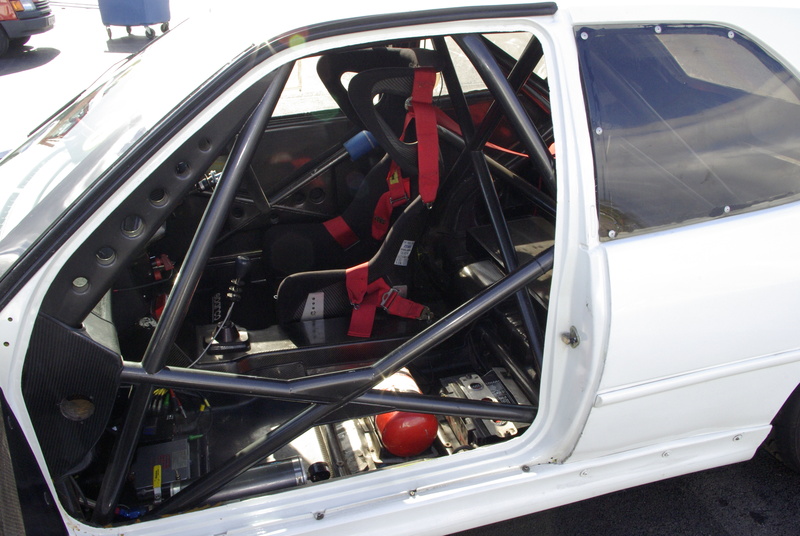 The overall weight of a car will make a huge difference to how it accelerates, brakes and turns into a corner. The distribution of the weight in the car is just as important and can be used to either tune or ruin the handling characteristics. It’s fairly obvious that having a light car means you can accelerate and brake faster, there’s less weight to move around. But just as important is how the weight is spread out across the cars tyres. Each tyre is actually holding up a different weight. In most road cars with the engine up front, the front tyres are holding up a lot more weight than the rears. 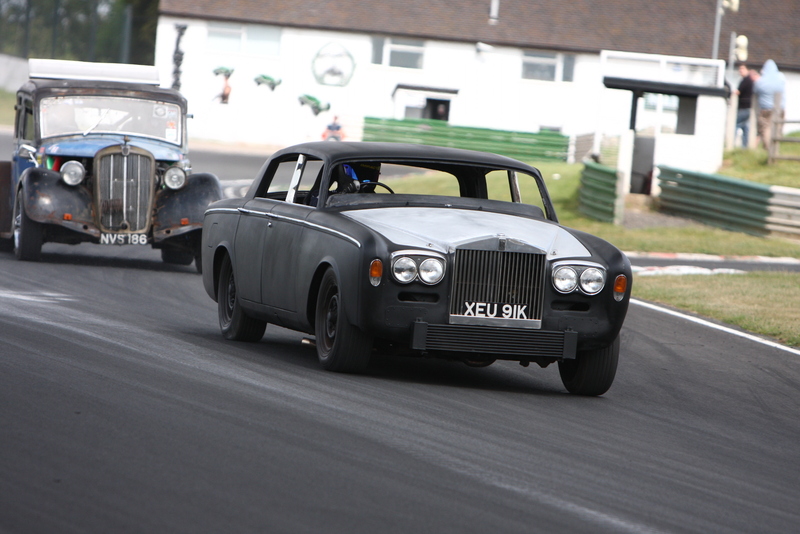 Likewise with only the driver in, the off side tyres are carrying more weight than the nearside. Amongst other things, the amount of weight (or down force) a tyre has on it will dictate how much grip it can produce, up to a point. From that you could think a heavier car could corner faster. The problem is that the cars weight also acts sideways in a corner and it takes some of the available grip of the tyre and pulls it sideways, causing the tyre to ‘scrub‘. All tyres scrub sideways when turning, it’s known as the slip angle. Push the slip angle too far and you’re sliding, push the slide too far and you’re spinning. Heavier cars increase slip angles faster than light ones so they run out of grip faster. To help ensure each tyre is carrying an equal load to start with, cars can be corner weighted. That involves raising the spring heights so more load goes onto the corners where there was less. Unless you have a very well balanced car the weight distribution will always be biased in one direction or another, but it helps to spread the cars weight as evenly as possible. This means each tyre is doing it’s fair share of clinging your car to the road. Corner weighting a car doesn’t necessarily move the weight distribution in the car, it just alters how the car’s suspension supports it. Of course all that talk of spreading the weight out on the tyres is massively over simplified. There’s so many other factors influencing how the car’s suspension behaves, and all we’ve considered so far is how the weight is supported across the four corners. We should also spare a thought for where the weight is in the car. Rather than just say the car has weight, the weight distribution around the car can all be added up and said to have a centre of gravity. It’s basically the balance point for all the weight in the car. If the car was hung from a rope attached at the centre of gravity it would always be balanced. 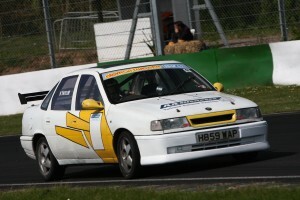 The centre of gravity also has a height within the car. 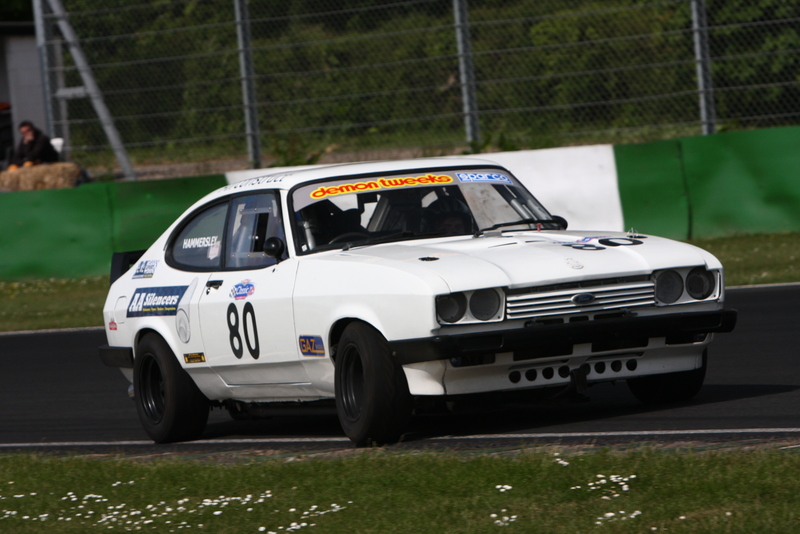 The higher the centre of gravity the more a car will lean as it corners. It leans, or rolls because opposing forces act on the centre of gravity as you corner. It’s those forces you can feel when you are pushed out of your seat as the car brakes or corners. This is called weight transfer. The more it rolls during a corner the more it takes load off the inside tyres reducing the overall grip available to the car. The centre of gravity rolls around a pivot point called its roll centre, which is set by the cars suspension pick up points. Unless you’re planning on moving the suspension pick up points the best way to reduce the amount of roll a car has is make it lighter and get the weight as low down in the car as possible. Stiffer suspension springs will resist body roll. Generally you’ll always want the softest springs possible for traction but stiff enough to stop too much weight transfer. Assuming your tyres are up to the job of transmitting the load then sometimes a bit more weight transfer in a straight line (pitch) helps push them into the road surface and get more grip. 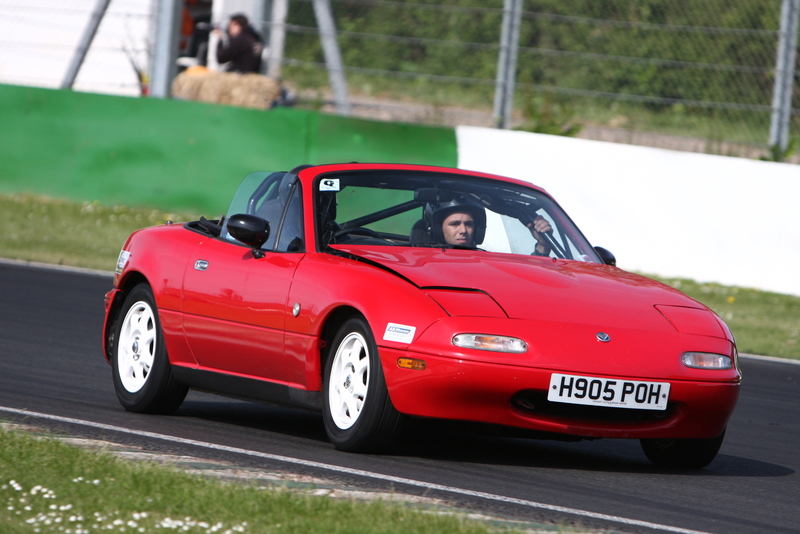 For example if you have a rear wheel drive car with the engine at the front you’ll need a bit of weight transfer to get the driving tyres to grip properly. Generally though too much weight transfer reduces grip and ruins the balance in the car, especially during cornering (roll). It’s that balance that everyone’s trying to find when they set a car up. How much weight your car has and where it’s distributed will affect how much weight transfer you have, how much work your suspension is having to do and so how hard you can push your tyres when accelerating, braking and cornering. 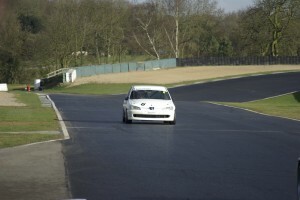 Performance driving techniques are all developed around shifting the balance around the tyres to get the best grip for the longest time. It’s all of these factors and more that we focus on when developing a car, and it’s driver. 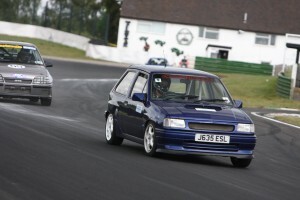 With the Pug all repaired after the problems at Snetterton we headed to what it basically my home circuit. I love Donington and it’s a perfect circuit for the agile little pug. Qualifying started in the rain and we were running fastest when I handed to my co driver for his qualifying laps. Early on he ran wide into the gravel but rejoined having seemingly caused no problems. Keen to make up for his mistake, and on a drying track his lap times tumbled and once again we wound up with pole position. Checking the car after qualifying revealed the trip into the gravel had pulled the alternator belt off and the battery was now flat. The car was jumped started and headed out for the race. 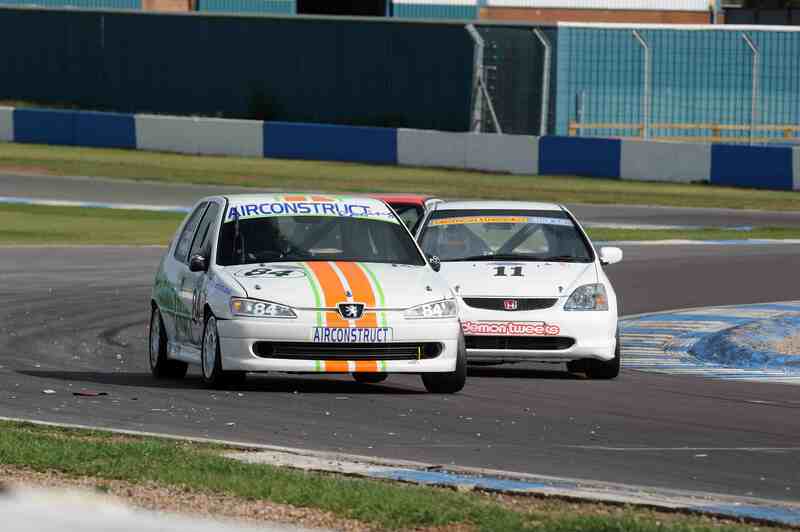 When the lights went green my co driver went off like a scalded rat, leaving the pack behind. At the driver change we had a healthy lead but the car wouldn’t start due to the flat battery. By the time we’d bump started it we were down to second. After 3 or 4 laps of chasing through the back markers I retook the lead, only for the race to be red flagged a lap later due to several accidents. We kept the win which was a nice result after the seasons poor start. 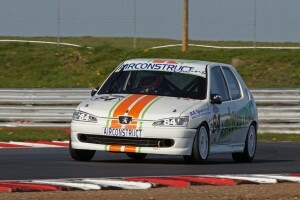 The first race of this season was at the new Snetterton 300 circuit. I’ve got to be honest I didn’t like it much, I missed the old fast corners but the revisions that have been made are definitely a challenge. I guess it’s just a matter of personal preference. Either way we didn’t get to see much action. 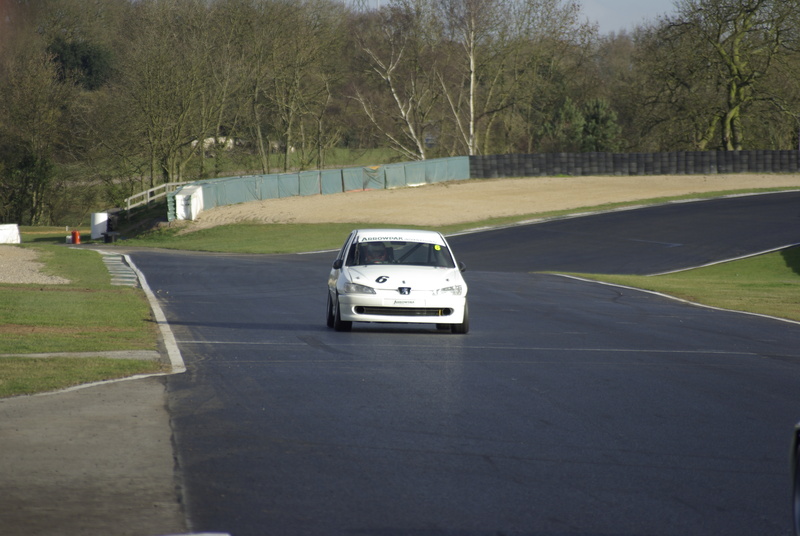 The car for this eyars racing as an ex BTCC pug 306 which is prepared elsewhere but we are helping with set up and driver training. 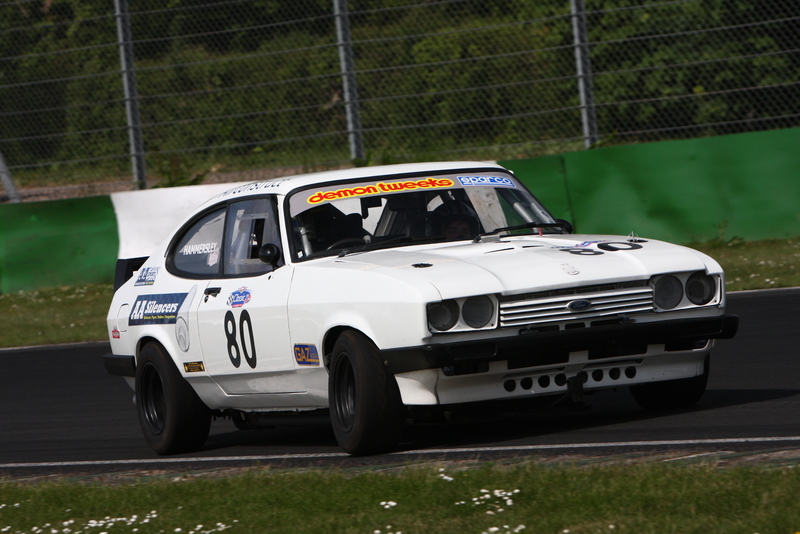 Half way into the qualifying session the wheel studs sheered leaving the front wheel to make a bid for freedom. It’s the first time we’ve run the car in anger and it’s had a hard life after 10 years of racing. There will clearly be some parts that have seen a lot of stress over the years so it’s understandable that stress failures will occur. On the plus side despite only running half of qualifying the car was still fast enough for pole position. Shame it didn’t have enough wheels on it to race! 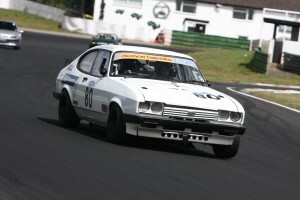 AA Silencers is going racing this year with sister company AA Sport. AA Sport deals with the performance side of the business including chassis tuning, car handling set ups and driver training. 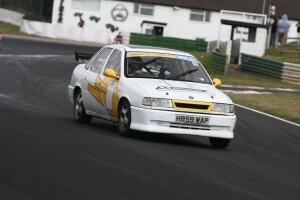 Company owner, Mark hammersley, is co-driving an ex BTCC Peugeot touring car. He shares the seat with Nigel Tongue who is campaigning his first season in this car. Mark will help with getting car and driver onto the pace and to the front of the grid. Pre season testing has gone well so far, time will tell when the lights go green at the first race!